As I said to one customer,” you are actually comparing the Sea Leopard to the other brand?” By the way she is now ecstatic with her new Sea Leopard. It’s a bit like comparing a Mercedes to a Leyland P76, mind you one is justifiably more expensive than the other. Without you having seen the Sea Leopard up close and having paddled one it may be easy to think that one sea kayak is the same as any other. The similarities between the other brand and the Sea Leopard end with the words “sea kayak” and “fibreglass”. Each Sea Leopard is meticulously hand manufactured for quality by myself, a qualified fiberglass professional. The hull lay-up of the Sea Leopard is in places over double that of the other brand, consisting of up to seven layers of composite glass materials, and the design allows full security of bulkheads, and in hull setup prior to deck placement. Our bulkheads are one of a kind, not hard fixed to the hull but rubber bonded to the hull and deck over 20mm, creating a flexible soft join rather than a hard break or bend point, resulting in no hull or deck fractures, creases or damage. 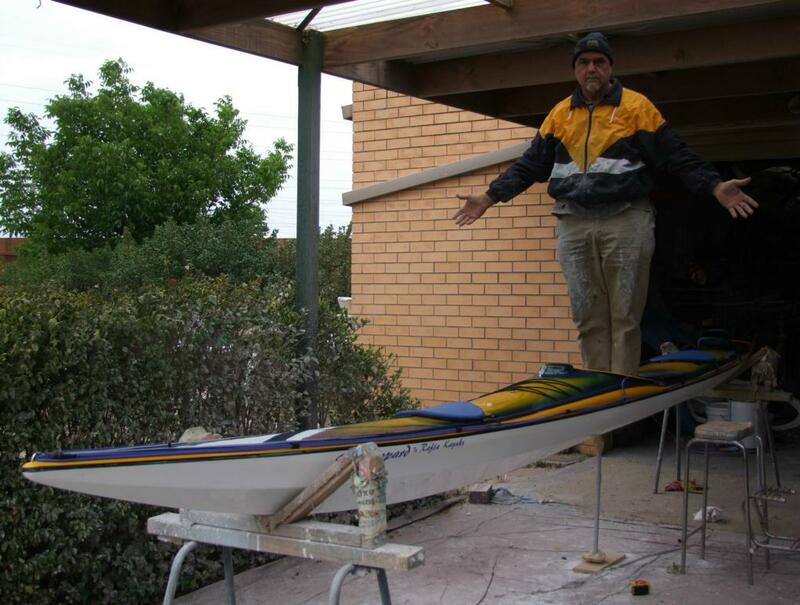 The upper deck structure has immense strength with again up to seven layers in areas, which probably make the all up lay-up of the Sea Leopard second to no other Sea Kayak on the market. The pricing of the Sea Leopard is based on the same base price of the other brand and the Greenlander. The Standard Sea Leopard is set up to suit the VSCK on water safety requirements, the only other thing you need is a paddle and vest. The Standard Sea Leopard has a proper sea rudder, long enough (250ml below the hull) to still give steerage when in rougher water and that is retractable, so that when beaching or dragging up a beach, the rudder is not damaged. The Standard Sea Leopard has a full circumference deck line as is required by serious sea kayak club regulations, not just on the ends of the kayak. The Standard Sea Leopard comes already equipped with an electric bilge pump run by a hefty fully sealed 3.2Ah battery, not a miniature battery. The Standard Sea Leopard comes with an easy charge coupling for charging the battery. The Standard Sea Leopard comes with a fitted mast step. The Standard Sea Leopard comes with a secure stainless steel “D” ring in the bow for locking off when necessary. The Standard Sea Leopard has an air equalization system to prevent compression and explosion of bulkheads. The Standard Sea Leopard has rubber backed marine vinyl double locking hatches, which once fitted correctly allow no water into compartments. The Sea Leopard has sealed rudder tubes that don’t allow seepage through bulkheads. The seat has been ergonomically designed to give correct posture and optimum performance and is positioned to give extra thigh support, to save body stress and tiredness. The design of the Sea Leopard gives exceptionally low windage so it is not affected by head or cross winds like other brands. To add to all this, the Sea Leopard has immense stability, both primary and secondary, and is up to 30 % more energy efficient than other brands. After all we do call it “The BENZ of sea kayaks”.